“Take nothing but pictures, leave nothing but footprints” is the classic advice for being a respectful traveler. But what does that really mean? The ‘Sustainable Tourism’ class, taught by anthropology professor Dr. Sarah Quick, works on answering that question. The topic at hand: the environmental and social impact of travel and tourism. Students don’t just explore these issues in the classroom; the course incorporates a number of field trips, where they can apply their lessons through experience. These field trips also give Cottey students an opportunity to explore some fascinating local and regional spots! On April 23, three Cottey College professors and eight students got insight into where art and activism intersect. 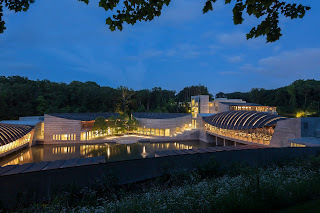 These students and professors attended a special event at the Crystal Bridges Museum of American Art in Bentonville, Arkansas. Organized by the Serenbetz Institute for Women’s Leadership, Social Responsibility, and Global Awareness, the trip offered a unique experience for Cottey students to explore a rare and powerful art exhibition as well asattend a presentation by the evening’s Distinguished Speaker, Patrisse Khan Cullors. An accomplished woman leader, Cullors is best-known as one of the co-founders of the Black Lives Matter movement. In 2013, she helped create the hashtag #BlackLivesMatter, provoking a national dialogue and sparking a movement. Cullors is also a writer, artist, and activist, who has long worked as a community organizer, advocating for racial, gender, and sexual equality. The future holds plenty of obstacles to conquer and problems to solve. How can the discipline and practice of psychology help? This theme — expressed as “Tomorrow’s Challenges. Psychology’s Solutions” — guided the focus of this year’s annual conference of the Southwestern Psychological Association. The conference took place April 12-15 in Houston, Texas. Dr. Julie Tietz, professor of psychology, represented Cottey College in her attendance at SWPA. At the conference, she attended sessions on the latest research on topics such as public perceptions of emotional support animals, book clubs as educational tools on human sexuality, and the therapeutic role of video games. In support of SWPA’s goal of promoting and strengthening psychology as a discipline, the conference offers opportunities for professionals, educators, and students to participate in workshops, symposia, and paper and poster sessions, as well as to hear from prominent keynote speakers. 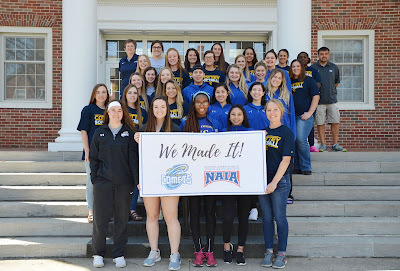 It's a new academic year for students and a new athletic affiliation for student athletes as Cottey College joins the NAIA! The Comets became members of the National Junior College Athletic Association (NJCAA) in 1999 when intercollegiate athletics were reintroduced at Cottey because the College was still a two-year institution. That membership made sense then, but in 2011 Cottey began offering Bachelor of Arts degrees and students could stay at Cottey for four years to complete their undergraduate education…unless they wanted to continue playing their particular sports. Those students had the unenviable task of choosing to leave Cottey to continue their athletic career, or abandoning the sport they loved to continue their baccalaureate degree program at Cottey. Associate Professor of Dance Jo Byrnesspoke to a Theatre Capstone class and presented three master classes in Laban Movement Analysis for students and the community at Northwest Missouri State University in Maryville, Missouri, March 11-12.Professor Byrnesalsoattended YogaFit® Level 2 Teacher Training March 24-25 in Baldwin City, Kansas. 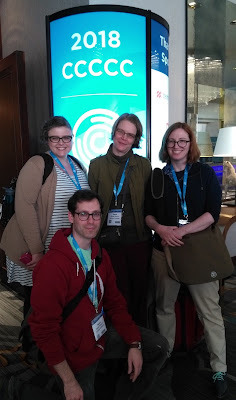 First-Year Writing Seminar instructors Melody Denny, Peter Hyland, Sarah Quick, Mary Laughlin, and Amanda Cook(not pictured) attendedthe Conference on College Composition and Communication (CCCCs) inKansas City over spring break. 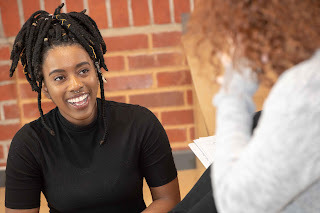 The group learned many things about peerreview, commenting on student writing, teaching research, and communityengagement that they can bring back to Cottey and the First-Year Writing Seminar. This trip was sponsored by P.E.O. funds.